Jack Wynn, 1944 en route to Ocean Grove. The caravan was left on site and the family returned to their home in Ballarat. 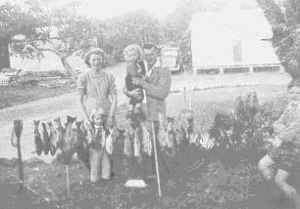 During that year Jack and Audrey decided to establish a Holiday Resort at Ocean Grove and several additional adjacent allotments were purchased at a cost of around $20 each. Mr. Dean passed away that year and as a tribute to him the name Wynndean was adopted. Soon after their third child Joy was born the family moved to Ocean Grove and lived in the caravan in extremely primitive conditions. The original permit from Bellarine Shire Council was for the erection of "hutments" and during the first 12 months Jack demolished 8 pre-fabricated army huts from Darley Military Camp on the Lerderderg Gorge near Bacchus Marsh and transported them to Ocean Grove behind the kerosene powered Essex. (petrol rationing). Two army huts were transported by Alf Nunn from Snake Valley, from Darley and placed at 32 Orton St. to form a residence and office. The 8 bungalows and several camping sites formed the basis of the original business "Wynndean Holiday Resort" and advertisements during 1947 boasted electric light, electric radios and controlled ventilation. (Flaps that opened!) Organized sports days were held for guests as well as flounder spearing nights and fishing trips on Swan Bay in the Resorts own fishing launch (Kingfisher). A train engine (powered by an A model Ford engine), open carriages with a seating capacity of c.100 and tracks were purchased with the object of providing a service from Orton Street to the beach. Unfortunately the Shire did not approve of the project and the train rusted until it was sold during the late 50's. Tariff in those days for a furnished bungalow during the summer school vacation was 2gns per week. Jack and Audrey purchased additional blocks during the next few years to the amusement of some of the older locals who thought of the area as useless sand-hills and scrub. Indeed the area had long been used as a dumping ground for cattle carcasses. No streets or tracks existed south of Orton Street and the Resort developed as a large contiguous area. "Breeze" from the Queenscliff Gas Works was carted by trailer to form tracks over the sand and a cutting was made through the sand-hills to the beach. Much of the work was done by Frank Hose with his horse and scoop as well as Jack using a shovel and wheelbarrow (steel wheeled on planks of driftwood). The tar from the gasworks was used during the 50's to bitumenise the internal roads. Heated with a wood-fired copper and spread with watering cans! It was during the post war Immigration boom 1949, that Jack and Audrey were approached by the Immigration Department to provide temporary accommodation for immigrant families. Through the purchasing of rationed building materials, the original 8 bungalows were rapidly increased to 65. Many were built by the immigrant men arriving ahead of their families and assisting with the construction. For almost 10 years many hundreds of families emigrating from Europe arrived in Melbourne and travelled directly to Wynndean as their first home in Australia. Their boxes (wooden shipping containers) usually arrived some weeks later. During this period we had busses travelling from Wynndean to Geelong night and day (Green Star Buslines - Red Snake) for shift work at International Harvester, Fords and Pelaco. A real community spirit existed not only in Wynndean but in a rapidly developing Ocean Grove. Most of the original immigrants were Polish, German and Ukraine and towards the end of this period Dutch and some British. Many of the families purchased or built in Ocean Grove however, most moved to Geelong. The average length of stay in Wynndean was around 12 to 18 months during which time enough money was saved for a house deposit. An example of the growth in population that Ocean Grove enjoyed during this period can be gauged from the school enrolments. It was a one teacher school with 11 pupils in 1949?? and in 1958 there were 9 staff and 280 pupils. Towards the end of the 50's the rate of emigration slowed and Wynndean reverted back to the Holiday Resort role and saw the expansion of sites and cabins to 400 during the early 60's. Towards the end of the 1950's the rate of emigration slowed and Wynndean reverted back to the Holiday Resort role and saw the expansion of sites and cabins to 400 during the early 1960's. The additional 330 sites developed during the 60's included 85 cabins built with permits and many with brick en-suite facilities connected to septic tanks. 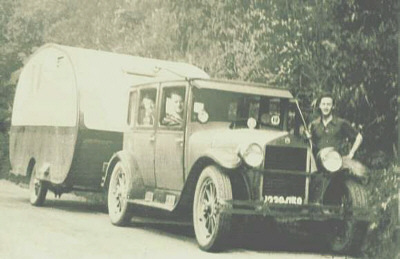 Most of the "caravans" were either bond-wood or rooms on wheels, and had solid annexes attached and roofed over. The two roomed cabins remained in use until 1995 when they were demolished and removed to enable the sale of the blocks they occupied adjacent the Surf Beach complex. In 1968 sons John and Roger returned to work in the business and Wynndean Holiday Resorts Pty. Ltd. was established. Wynndean became the first sewered property in Ocean Grove and during the next 10 years all the facilities and amenities were completely rebuilt and all the sites connected to the sewer mains. Some 200 old caravans were replaced with modern aluminum vans, and the built annexes replaced with prefabricated aluminum annexes. Approx. 5000 metres of fencing was built and power, water and telephone cable reticulated throughout the park area. Son Greg returned to the business in 1972. The original 65 bungalows were demolished and replaced with sites during the late 70's and early 80's. Currently the Park has some 250 sites with most of the sites occupied by holiday caravans which remain on site throughout the year with the owners using them throughout the year. Wynndean is a rather unique Caravan Park with the sites located randomly amongst the native trees - Jacks direction to early campers was that if they could fit their van in without disturbing the trees then it was a site! Wynndean is certainly one of the oldest Caravan Parks in Victoria and has had a profound influence on the growth of Ocean Grove - Not only through the many new Australian families", that have made the town their home but by the hundreds of families - who have holidayed in Wynndean and subsequently adopted the Grove as their home.